Each year of being married brings so many new joys and challenges that it’s important to stop and reflect. Whether it’s an intimate dinner for two or a big family party, there’re wedding anniversary gifts to suit the occasion. From single prints to collages, from canvas to glass, the options are as endless as your love. Your love is new, so is this whole wedding anniversary gifts thing. Be sure to take some time to think about what your spouse will love. Ideas for one year anniversary gifts must include flowers or chocolates, your loved one will adore a personalised photo. Your love grows stronger each day and thoughts of starting your own family are becoming more than just words – it’s starting to become very real. It’s OK. It doesn’t mean you have to put away your party shoes just yet. Most importantly, pause to enjoy each other’s company and relish in the freedom of life before kids. Anniversary presents ought to mirror the phase of your life you’re in. That’s why photos for your home or office are the ideal gift of love, with memories that live on and on. Celebrate your 5 year milestone in style with a gift fit for a king or queen; a gift they’ll treasure for years to come. Rather than cluttering the home you share together with more useless ‘stuff’, express your love in a unique way with some wall art that will become one of their most treasured possessions. Five years together is nothing to sniff at, so a gift that is personalised – something that is quintessentially them – is the way to go. In fact, wall art may even become your ‘thing’. Consider a thoughtful quote on a colourful single canvas. It might be a love poem or it might be an arty visual tally of all the days, months, minutes and seconds you’ve been together. An even more creative idea is to create a collage featuring photos – one from each of the five years – of you sharing a special moment together. Now that’s a tradition worth keeping. Done lots of travelling? Create a collage using our travel themed canvas or design your own, filling the frames with whatever you like – travel quotes, love messages or simply photo after photo after photo. Share a hobby together? Whether it’s golf, cycling, bushwalking or even playing bridge, honour the time you spend together by printing a photo series of those fun times. It doesn’t matter where – the beach, the park, your garden. 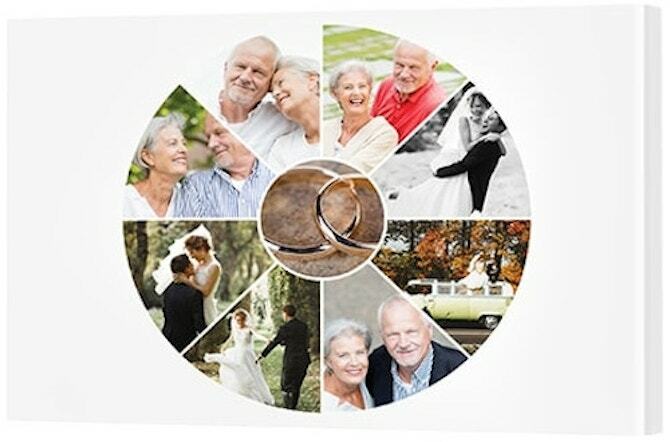 Once you receive the photos, sit together at the computer and choose which photos you’d like to include in a collage or wall display. If she loves pearls, this is the perfect opportunity to gift her with something that incorporates this exquisite jewel of the sea – a creative photo display featuring pearls. It’s a clever concept for the woman who has everything (including a string of pearls) and an ingenious idea for the man who can’t afford everything (like a string of pearls!). The best thing about such thoughtful presents is they’re not only a great party treat, they end up as memories that live on long past the gift-giving ritual has ended. A golden wedding anniversary isn’t just about marking 50 years, it’s about reflecting on all those years you experience together. Visit www.canvasfactory.co.nz to create your Canvas Print today. ← Previous Post: Why Use HD Metal Prints?